Spirit Guides and Spiritual Teachers. You’ve been there through thick and thin, you’re the strongest person that I know, and I hope that you know how much I appreciate every little thing you do for me. 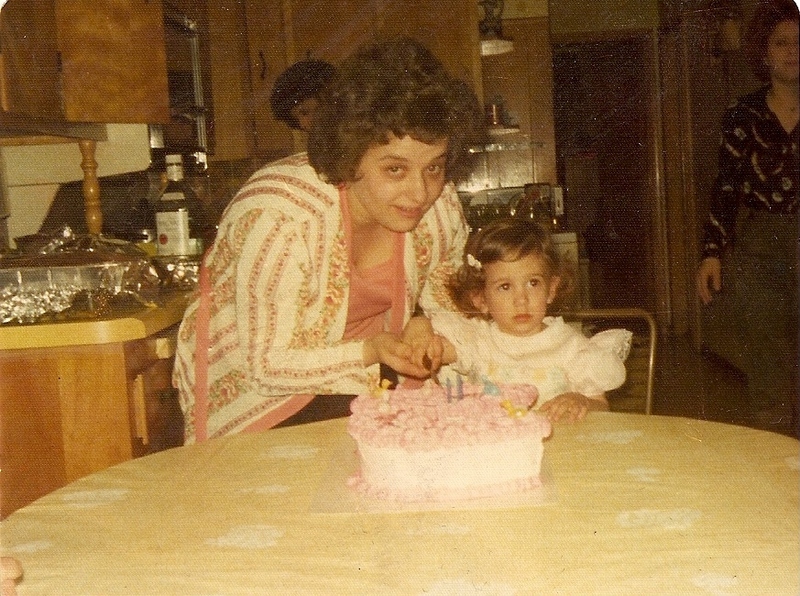 Mom and me on my second birthday, circa 1977. The term, Spiritual Teacher, is one that I was inspired to use as a way to describe my connection with Spirit. By this, I mean that not only will you receive some information from Spirit during a reading with me, but you most likely will receive some ‘homework’ as well, but before I go into that, I first need to explain a bit about the role of Spirit Guides in your life. In the past couple of weeks, I’ve been seeing a lot of other Mediums talking about Spirit Guides. These beings are not here in the flesh, but reside on what I call “the Other Side,” and are our guardians as we walk through life. Yes, your loved ones do continue to watch over you when they make the transition to Spirit, but they are not referred to in this way, because they have a different connection to you. Spirit Guides help you with your mission in life. They speak to you in soft whispers and frequently are the beings that cause you to notice synchronicity in your life. It’s no accident or coincidence when you see something in succession over a short period of time. The reason you suddenly see something that you didn’t notice before that somehow seems important or relevent is because it’s a piece of a message your Guides are trying to help you receive. Some of us are more open to music, while others notice words or even names. For example, if you have a question that you’ve been wondering about, Guides will sometimes answer you by making sure you hear a song with the answer in it– in the car on the way to the grocery store, then in the grocery store, and usually a third time, maybe while you’re on hold while making an appointment. Don’t doubt it! Give it a chance. What do you have to lose? Guides cannot control you. It is always your choice to listen or to ignore their messages. Before you were human, you were a Spirit with the desire to learn for God. Being here on Earth is like getting amnesia. You forget what you planned, where you came from and why you’re here. So, you make an agreement with another soul prior to your incarnation whose role is to keep watch over you from the other side, and make sure you stay on track with what you came to Earth to accomplish. Let’s say you decided to come here and do work as a ‘lightworker.’ This is someone whose purpose is to helps others to develop spiritually in some way. If you find yourself working at a bank in the mortgage department, miserable with your job and your life, one of the ways your Guide may inspire you to do what you are meant to do is by sending people your way to remind you of why you’re here. Maybe a customer will mention he or she is an author, and gives you a copy of their book- which happens to be on a spiritual subject. This will get the ball rolling and your Guides know this. It’s their job to keep you in-the-know! At that point, you will feel as though something about the person, the book or the situation seems familiar. This is a good clue that you are being guided by your ‘people’ to keep going in the direction of your life’s purpose. Having said that, if you come to me for a reading, these beings are definitely going to be a part of it. There are those who say that it’s a ‘no-no’ to talk to clients about their Guides, because it is a very personal experience to get to know them, and one shouldn’t put a preconceived thought out there prior to this meeting. The simple truth is, if you go to a medium like myself, and Spirit comes forth with a being that is one of your Guides or even an Angel, you are meant to receive it. I am beginning to understand that my purpose in having a connection to Spirit (and yes, we all say “why me?” when it comes to these things) is to help others connect to the other side on their own. This means bringing to light the fact that there are many spirits waiting to help us. Although it’s a new age concept, Spirit Guides have had many names over the eons of time man has incarnated on Earth. We all know we have help, but we become wrapped up in the “who” and “why” instead of following what we know in our hearts to be the truth. We question and rationalize things that we needn’t use our logical minds to understand is the truth. Becoming human is a major endeavor for all of us, Spirits. We know this before coming here, but once we are here, the forgetting begins. My role as a Spirit Medium and Messenger is to help bridge the gap between who we are here on Earth, and who we really are, in Spirit. As a Spiritual Teacher, it is my job to help you understand that you are not alone, that you are a Spirit on a human journey, and that your loved ones are still a part of your life. I’m not a one trick pony, so to speak. Believe me, sometimes I think that would be easy, but I know that I didn’t choose an easy road in this life. I don’t know everything, and please run in the opposite direction of anyone that does, but I do know that what I’m doing here has a purpose– which is to help you understand yours. ~ by healingstarspirit on May 10, 2010.